We need 4 teens for each mass, for 3 weekends to help sell jewelry. April 27/28 – May 4/5 – May 11/12. Click here to sign up. Fr. Lou will be giving a training session for ALL interested in serving as a Eucharistic Minister or a Lector. It will begin at 3:30pm in the main church-NOTE CHANGE OF DATE: May 5th is new date. Eucharistic Ministers must have received the sacrament of Confirmation before serving. Lector is open to all 8th grade and above. Click here to sign up. This guitar camp includes free lessons provided by Justin Lantz and a chance to win a free acoustic electric guitar. Students can come and learn basic guitar chords and build up their confidence. The “No Fret” ministry is all about providing a free opportunity for students to get a basic introduction to music and offer them joy of a lifetime of music. There are only 12 spaces to join. Camp runs June 17-21 from 1pm-3pm in the Youth Center. Click here to sign up. Students must have their own guitar, however, there is a chance to win a free guitar in a raffle on the first day of the lesson. Mentors, we really need 4-5 mentors to help out when you can on Sundays and Wednesdays in the summer. Please prayerfully consider helping out when you can – the nights are light – come play at open gym and pray at the end of the night. On Sundays, you may lead a small group discussion with written questions. Thank you ahead of time for sharing your time this summer. Click here to sign up. June 2nd, 4-5:15pm Hidden Lake Parent/Chaperone & Teen meeting in the youth center. Click here to sign up. How is catechesis taught? What textbook do you use? There are no classrooms & no “textbooks” in the Middle School EDGE model. Instead, students learn about & interact with their faith through mentors and dynamic videos, which take place on Wednesday evenings for Middle School. On these nights, students will be engaged with their peers and mentors in large group settings and small group settings throughout the month. Material comes from Life Teen resources, which use a curriculum that is based on the guidelines set forth by the US Conference of Catholic Bishops with the use of scripture and the catechism. Students become engaged as well through many opportunities to encounter Christ through prayer, adoration, devotions, and spiritual exercises that help them foster a personal relationship with Christ. What does it cost to register for Middle School EDGE? Our Middle School EDGE is $60. That includes programming during the fall and spring semesters. Our summer youth ministry program is free for all to attend, however, the summer program is focused mostly on building community and does not meet the required religious education needs. We also encourage our students to evangelize to their friends who may not be catholic to try out our Youth Ministry program for free. What does Middle School EDGE look like at St. Timothy? We encourage students to attend our Contemporary Mass at 5:30pm every Sunday. This Mass has modern music and lively homilies that engage our students. EDGE meets on Wednesday evenings from 6:45pm-8:15pm during the fall and spring and 6:30pm-8:30pm during the summer. These nights include fellowship, games, catechesis and mentoring. EDGE also hosts a day retreat, service opportunities, dances, and other fun events throughout the year. Check out our EDGE Events Calendar for more information about special events by clicking here. Who plans the Youth Ministry Nights? Who runs them? Our EDGE and Life Teen Nights are run by an energetic group of adults who we call Mentors. Our Middle School EDGE Mentors are committed every Wednesday evening and our High School Life Teen Mentors are committed every Sunday evening. 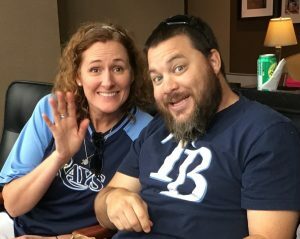 They are committed to mentor students and plan our EDGE and Life Teen Nights along side our Youth Ministry Director (Justin Lantz) and Youth Ministry Coordinator (Jen Linder), using the Life Teen resources. All of our adults are Safe Environment trained, Background Checked, and trained on how to use our resources to help in Catechesis. We also have Jr. Mentors who are our High School 11th and 12th grade students who have felt the call to minister especially to our Middle School students and help play a leadership role on High School retreats. How can parents and other volunteers get involved? The success of the St. Timothy Youth Ministry program is directly related to the number of hands that pitch in to help. There are many ways you can get involved. Each volunteer plays a valuable part. An invaluable part of our ministry is our food ministry. On Sunday evenings we intentionally feed our High School students before we start that night. This is not done just to get food in their stomachs, but we recognize the need for them to sit around a dinner table together with their mentors is important for ministry to build relationships. Food is prepared by a group of parents or a parish ministry. Youth Ministry is predominately made up of our mentors. Our mentors develop and plan our Youth Ministry Nights and are part catechist, part cheerleader, and part sympathetic ear for the students. Life Teen and EDGE also is in need of leaders who can help plan and implement our Youth Ministry Retreats. These are overnight retreats that help lead students to encounter Christ in a special way. We are always looking for helping hands who are good doing behind the scenes set up, clean up after meals, build environments, send out birthday cards, help in the office and run our café in the Youth Center. Finally, and most importantly, we need committed volunteers to pray for our students. Of course, anybody can do this from wherever you are however; we would like to coordinate with those who pray for our students so that we can share the student’s specific prayer requests with our prayer warriors. There are so many things that our students need prayer for and the more volunteers we are able to get to pray for our students the more grace will be poured out into this ministry. For more information about these ministries, please contact Justin Lantz at justin.lantz@sainttims.org or Jennifer Linder at jen.linder@sainttims.org. We are always looking for willing hearts to join us! June 4th, 7-8pm meet in Underground of Youth Center to discuss upcoming trip. Click here to sign up. We need 4 families per specific dates. Invite other families to join you! Sign Up Here! All graduating seniors are invited to join us at the 5:30pm Mass on May 5th. See Mrs. Jen for a candle before Mass begins. All seniors will be prayed over during Mass. Following Mass we will have a meal and cake to celebrate, then fun competitive games in the youth center between each grade to see if our seniors can hold the 1st place title! Click here to sign up! This training is for anyone entering 9th grade in 2019 through 12th grade. We are looking for mature, engaged, organized, fun loving, faith filled teens to lead other teens closer in their faith journey. This training will help you to become equipped to be an Edge Jr Mentor for Wednesday nights, Edge leader for middle school lock-ins, LifeTeen leader for retreats and small group sharing after attending 1 retreat and must be in 10th grade. We look forward to growing in faith with young leaders who are committed to attendance, leading others, giving freely of their time, and making parish community a priority in their daily life. Contact Justin or Jen for more info: Justin justin.lantz@sainttims.org or Jen jen.linder@sainttims.org. Click here to sign up. Deacon Glenn Smith would like to encourage any teens who would like to travel with him to the sick and homebound for service hours. Please email deaconglenn@sainttims.org for more information. There are no classrooms & no “textbooks” in High School Life Teen model. Instead, students learn about & interact with their faith through mentors and dynamic videos, which take place on Sunday evenings for High School. On these nights, students will be engaged with their peers and mentors in large group settings and small group settings throughout the month. All of our material comes from two main sources, YDisciple and Life Teen. These two sources use a curriculum that is based on the guidelines set forth by the US Conference of Catholic Bishops with the use of scripture and the catechism. Students become engaged as well through many opportunities to encounter Christ through prayer, adoration, devotions, and spiritual exercises that help them foster a personal relationship with Christ. What does it cost to register for High School Life Teen? Our High School Life Teen is $60. That includes programming during the fall and spring semesters. Our summer youth ministry program is free for all to attend, however; the summer program is focused mostly on building community and does not meet the required religious education needs. We also encourage our students to evangelize to their friends who may not be catholic to try out our Youth Ministry program for free. What does High School Life Teen look like at St. Timothy? Every Sunday Night students gather for our Contemporary Mass at 5:30pm. This Mass has modern music and lively homilies that engage our students. After Mass High School students gather for a meal in our Hall. Following the meal, we gather in our Youth Center for a Life Teen Night that ends at 8:30pm. These nights include fellowship, games, catechesis and mentoring. We also host two overnight retreats, monthly service opportunities, concerts, dances, pilgrimages, a mission trip, and other fun events throughout the year. Check out our HS Life Teen Events Calendar for more information about special events by clicking here. Our Middle School EDGE and High School Life Teen Nights are run by an energetic group of adults who we call Mentors. Our EDGE Mentors are committed every Wednesday evening and our Life Teen Mentors are committed every Sunday evening. They are committed to mentor students and plan our EDGE and Life Teen Nights alongside our Youth Ministry Director (Justin Lantz) and Youth Ministry Coordinator (Jen Linder), using the YDisciple and Life Teen resources. All of our adults are Safe Environment trained, Background Checked, and trained on how to use our resources to help in Catechesis. We are always looking for helping hands who are good doing behind the scenes set up, clean up meals, build environments, send out birthday cards, help in the office and run our café in the Youth Center.